A few weeks back, I taught a FERS retirement class, and I heard myself mutter something I hadn’t thought of in years! “If I had a dollar for every time someone asked me ‘what’s the best day to retire?’, I’d be rich!” I chuckled because my Nana always said that when I was growing up! Funny how phrases stick. You need to know the answer to this question BEFORE you select your retirement date: When does your FERS pension start? Now, the technical answer is the first day of the following month after you retire. Huh? It gets easier if we use a picture it. 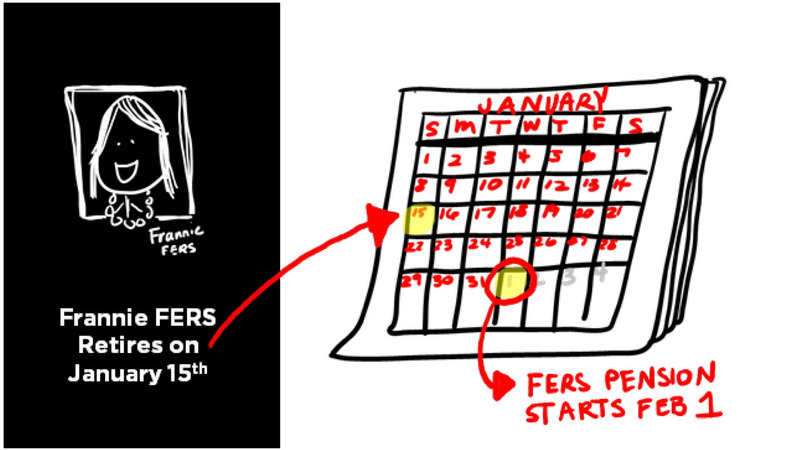 Let’s pretend that Frannie FERS retires on January 15th. Her pension doesn’t start until February 1st. This could leave Frannie in a bit of a “pickle” because she won’t be getting any pension until the next month. That’s why the general rule of thumb in FERS is to retire on the last day of the month—no matter what day of the week! I wish it were that easy (and I bet you do, too). 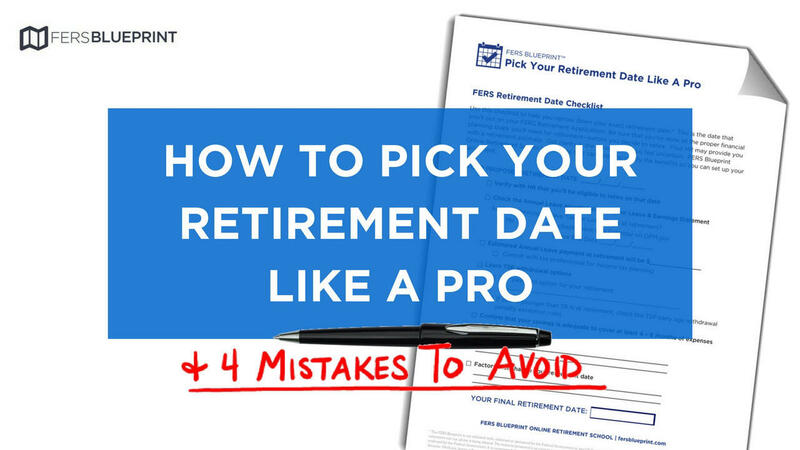 But there’s a bit more to picking your retirement date. I'll show you some mistakes that you’ll probably want to avoid. Here’s the challenge: The Leave Ending Date changes every year, so this can be tricky. Check here to see OPM’s Leave Ending Dates so that you can avoid this potentially costly mistake. Let’s just pretend that Sam Sample retired on October 31, and he’s earned most of his regular income having worked for most of the year. Now, Sam get this big Annual Leave payment and it puts him into a higher tax bracket. He’s worried because he had to pay more taxes unexpectedly in April. A lot people plan to use money from their TSP when they retire. But they aren’t too clear about age restrictions before they pick their retirement date. Normally, you must be at least 59 ½ year old (yes, the IRS really does mean that), to take monies out of your retirement savings account (like TSP or IRA). If you’re younger than that, you could have to pay something called an early age withdrawal penalty, plus normal income taxes. This can get expensive. BUT there's an exception for your TSP. 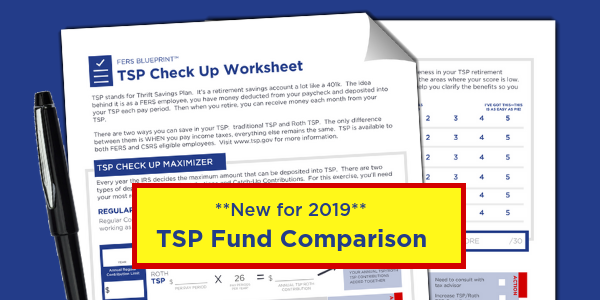 If you retire or separate from service (retire, quit or RIF) in the year in which you turn 55 years or older, you can take withdrawals from TSP without any early age penalty! It’s called a waiver. The Moral of the Story: If you’re retiring under age 59 ½, you should strongly consider leaving your funds at TSP because of the early age withdrawal wavier. You can read the full details from TSP here. Be prepared to wait because OPM’s retirement application processing time can vary quite a bit. I’ve seen 6 weeks’ time all the way up to 9 months before the full pension is received. It can be a big mistake to retire without enough savings to take care of expenses—and money can get very tight fast. Even TSP can take 4-6 weeks after you retire before you can request payments. It makes good financial sense to start retirement with at least 4 – 6 months of expenses in a saving account. Make sure that you know how to pick your retirement date like a pro—before you get ready for your retirement party! If you’ll have “use or lose” leave, check the leave end calendar so that you don’t risk losing that extra leave! Talk with your tax professional about how the extra income from the Annual Leave payment may impact your tax planning. Map out how you’ll access your TSP monies. And finally, have enough saved to wait while your retirement application is “in line” at OPM.